Check your emails! 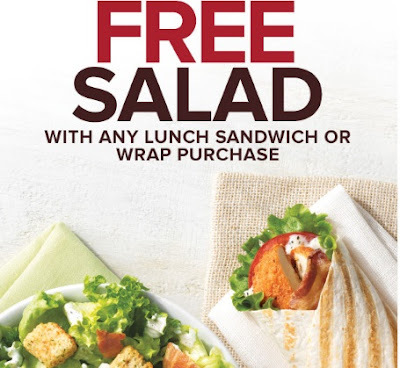 Tim Hortons sent out a coupon today for a Free Salad when you purchase a lunch sandwich or wrap! The coupon is one-time use only for the email address that it was sent to, therefore I cannot share a direct link here. The expiry date of the coupon is July 31, 2016. You can print the coupon or show it on your smartphone to get the offer. The coupon must be scanned at a participating Canadian Tim Hortons restaurant to redeem. Valid only at participating Canadian restaurants. You can also request a coupon at the link below. It will take 24 hours to receive the coupon.